Black silk taffeta, lace and chiffon; embroidery of silver beads, rhinestones, sequins, and green rhinestones; eight-paneled skirt; Aztec/geometric motif. A silvery circular pattern, similar to the type of patterns featured in Aztec art, almost floats against the background of a full black skirt. It is an outstanding manifestation of both the taste for the exotic during the 1920s and the color sensibility of the Art Deco movement. 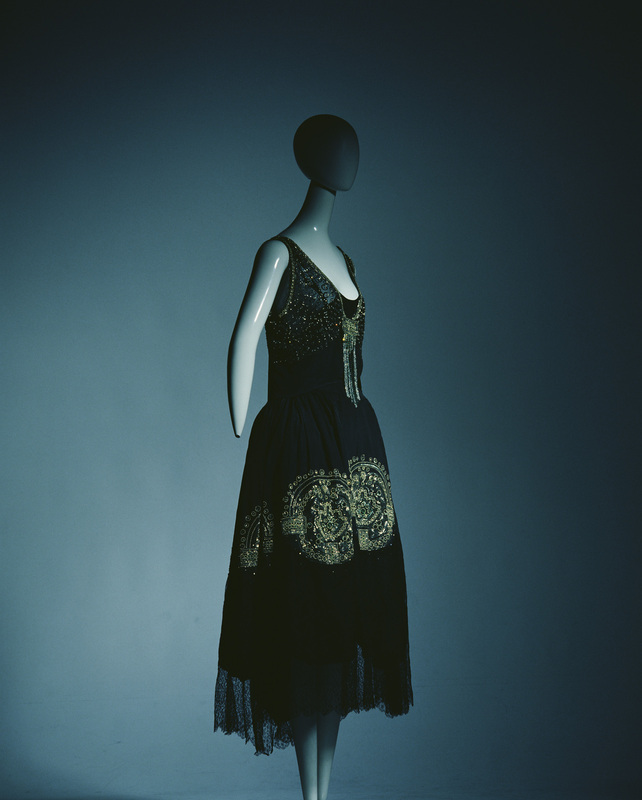 This is a typical example of the "robe de style" favored by Jeanne Lanvin. The trend in utilizing motifs from ancient civilizations such as the Mexican and Egyptian civilizations conveys the excitement surrounding the archaeological discoveries of the day, such as the excavation of Tutankhamun’s grave in 1922. While designers such as Chanel rapidly spearheaded an innovation in clothing during the 1910s and 1920s, Lanvin continued to create elegant and refined "robes de style." Lanvin’s outstandingly elegant dresses, characterized by full skirts and the extensive use of decoration such as rich lace and embroidery, were popular amongst clients who continued to value traditional beauty and didn’t embrace the modern, boyish fashions of the new era.